Welcome to the RCGS Resolute – your mobile wilderness lodge taking you to Greenland and the Canadian Arctic next August. I travelled to Sydney, N.S last month to see the ship on the occasion of her re-commissioning as the RCGS Resolute. She is perfect! Exactly the right ship for our “Epic Northwest Passage” voyage. 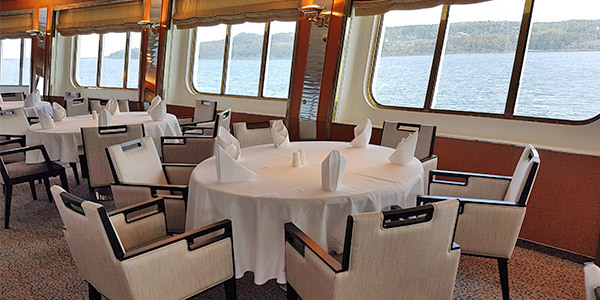 I’m delighted to report on the ship and to share with you some of the features that really impressed me and that I know you’ll enjoy on board. First off, the great outdoor spaces. 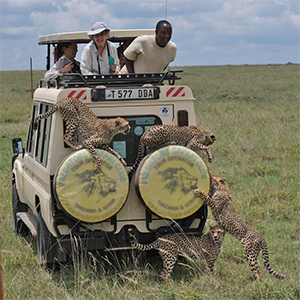 After all this is an expedition cruise and you will want to spend as much time as possible outside. I can see myself getting comfortable on a deck chair aft on Deck 6 with a hot chocolate, looking out over the Arctic Ocean. Midship on Deck 7 is sure to be another favourite spot – full height side walls with large windows provide excellent shelter from the cool ocean breeze – it will be cozy even when the wind blows…. 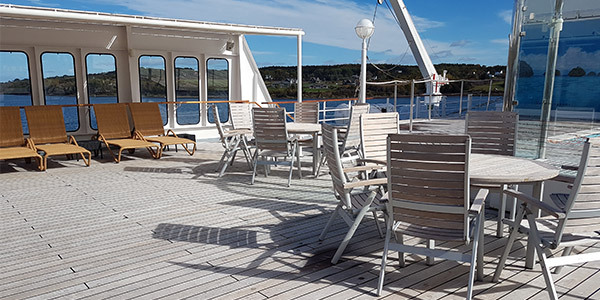 The best view of all is from the roof – Deck 8 has 360 degree views – grab a deck chair and find your spot to take in the incredible surroundings. 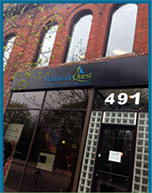 This is where you’ll find our naturalists looking out for whales, birds, and polar bears. And inside, you’re not missing any of the great views. Every common area has big windows out over the ocean. The library lounge on Deck 7 is your quiet spot for reading and contemplation with big forward windows and comfortable seating. In the main restaurant, every table is a window table. The bistro lounge has indoor and outdoor seating; hopefully we’ll have a few double digit temperature days to enjoy al fresco dining in the Arctic. Even in your own cabin, you’ll have terrific views; every cabin has a lounge area adjacent to the large picture window - brew up a tea or coffee from the in-room station, curl up and enjoy! I was concerned that the ship might be too “cruisy” – fearing that the expedition feel might be lost. I was pleasantly surprised to find that the comforts don’t overwhelm the adventure. The ship’s interior is paneled in light wood with lounges and cabins decorated simply with spectacular large photos of wildlife. All cabins are a very comfortable 22m² in size (and the One Ocean Suites are an indulgent 44m².) Beds can be configured for either a queen or two single beds (I appreciated the nice touch of the directional bedside reading lights.) Floors are carpeted to create a really cozy feel. Bathrooms are bright with good sized showers (equipped with a fold down seat.) Athletic types will enjoy the gym with a treadmill, rowing machine, stationary bikes, and elliptical machines – the view out over the ocean is sure to be inspiring! There’s a small outdoor pool too if you’re feeling brave – but I’m more likely to be in the glassed in Jacuzzi (or maybe in the sauna). The little extras are well thought out but not obtrusive – the focus is very much on the adventure around us. There are lots of interior common areas to enjoy. 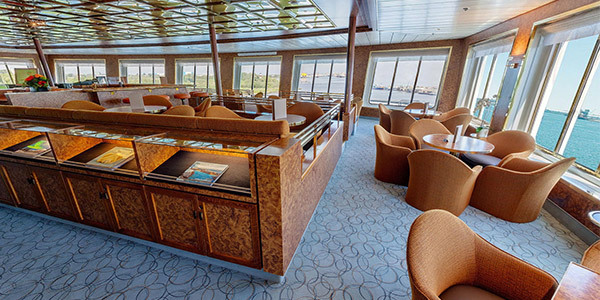 As well as the library lounge, there’s a second larger lounge and bar on Deck 5. This is where our study leaders will give their presentations. It will also be the place to gather for a pre-dinner drink after a busy day of exploration and to participate in the expedition leaders’ briefings. There is ample seating in spacious sofas and club chairs and exceptional views out to port and starboard. Together with the library lounge and all the amenities of the wellness centre, you’re sure to find your favourite spot, either to enjoy the company of fellow travellers or to find a quiet space on your own. She is very much a ‘right-sized vessel’ for Arctic exploration. The RCGS Resolute has a maximum capacity of 146 passengers. For our voyage, we’ve limited the capacity to 100 participants plus our team of study leaders and staff. 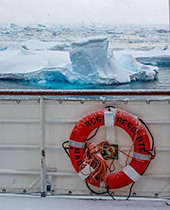 The RCGS Resolute is named for the storied 19th-century ship HMS Resolute and is the first vessel to have the Royal Canadian Geographic Society prefix attached. She’s entering into service as the latest addition to the B.C.-based One Ocean Expeditions fleet this month and Worldwide Quest is the first to charter her for our Alumni Expeditions “Epic Northwest Passage” voyage. If you have any questions about the ship, please do give me or Kerry a call. We look forward to welcoming you on board in August!